Ahhhh…… The Velvet Elvis Saga; what a fantastic journey that was. Ok, so in 2003 what was viewed as a lowdown, dirty robbery at first, blossomed into a beautiful and meaningful liberation/emancipation. It was a picture perfect evening at Dave's Pizza that happened to fall on a race weekend at Talladega. A fraternity from Birmingham-Southern College was winding down a party at the restaurant; I strolled into the restroom at Dave's to be rocked to the core at what I saw (or didn’t see). 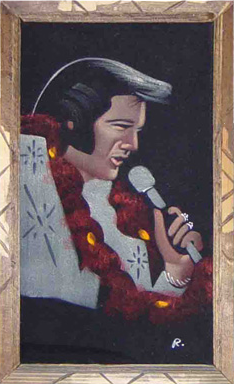 For ten years an old family artifact had been hanging on the wall above the toilet, our beloved Velvet Elvis; a gorgeous oil painting done on an even prettier black velvet background finished with an antique cypress trim. It was gone, well most of it anyways; the painting was screwed and anchored in to a cinder block wall. The perpetrator put some time and effort into forcefully “liberating” the inanimate object; all that was left were some screw holes in the wall and the bottom piece of framework, which is still hanging on the wall in memoriam. Blinded by rage, I approached an employee of mine who actually belonged to the fraternity that was having a party there that night; “You go over to your little party over there and get my painting NOW, no questions asked” the kid looked at me like he was staring death in the face. “Sir, I know how obvious this looks, but I swear to you they say they didn’t do it” the kid looked sincere. I was furious. Two weeks had passed, a package was delivered; a manila envelope with no return address, containing a ransom note; of sorts. The letter stated for us not to worry, that the painting was in good hands and would return someday. For two years to follow, almost like clockwork; we would receive an anonymous package once a month containing a photograph of our beloved painting in an obvious part of the southeast. The photographs were taken at noticeable places like Talladega racetrack, the gates at Graceland or the women’s room at the Red Bar in Grayton Beach. But then, they started expanding to the whole of the United States like New York and Seattle. Shortly after it went Global, we were receiving pics from Mexico, England even Australia; our minds were COMPLETELY BLOWN! Who was this? We didn’t have a clue, once the media caught wind of the story accusations were made, but to no avail. No one knew who it was. “The King Returned” - On a cool October night in 2004 a limo rolled up in the front of Dave’s; we didn’t take notice, this is a pretty common occurrence at our place. A red carpet was rolled out and an unbelievably beautiful young woman rose up out of the limo carrying the painting in her bosoms. As the restaurant erupted in jubilation, the beauty queen presented the priceless heirloom back to it’s appropriate owner, Me! Although the entire restaurant seemed to have been in on the scheme; no one took blame or should I say, claim the title of “Kingnapper”. We received nationwide notoriety for the story; money couldn’t buy the marketing that was provided by the saga. Not only did all of the local TV and Radio Stations do segments (and follow up stories), it achieved accolades from National News stations as well. Years after the coals of the story had long burned out; the Kingnapper revealed himself to be none other than one of our loyal regulars.